When backing out of a driveway or leaving your garage, watch out for children walking or bicycling to school or the bus stop. When driving in school zones, always reduce your speed and be ready to stop quickly if necessary. Be alert and watch for children playing and congregating near bus stops. They may dart quickly or be unaware of traffic. Learn and obey school bus laws for your state. 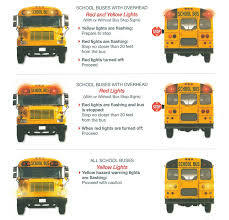 Learn the flashing light signal system that school bus drivers use: yellow flashing lights indicate an impending stop. Drivers should slow down and be prepared to stop. Red flashing lights and extended stop arm indicate students are getting on or off the bus and motorists MUST stop. Always err on the side of stopping if you are unsure what the bus is trying to signal. Get to the bus stop at least five minutes before the bus is expected to arrive. As the bus approaches, stand at least 6 feet away from the curb where the bus expected to stop, and line up away from the street. Wait until the bus stops and the driver says it is safe before approaching the bus. Never walk behind the bus, and if you have to walk alongside the bus, walk at least 6 feet away. If you drop something near the bus, tell the bus driver. Never pick something up off the ground near the bus because the driver may not be able to see you.